Greater prairie-chicken males fight on a lek in the Nebraska Sandhills. While photographing from a camouflaged blind, I marveled at their aerobatic displays that often lifted them out of the frame during fights. The fights are a battle for the right to mate and there were as many females as males on the lek on this particular April morning. 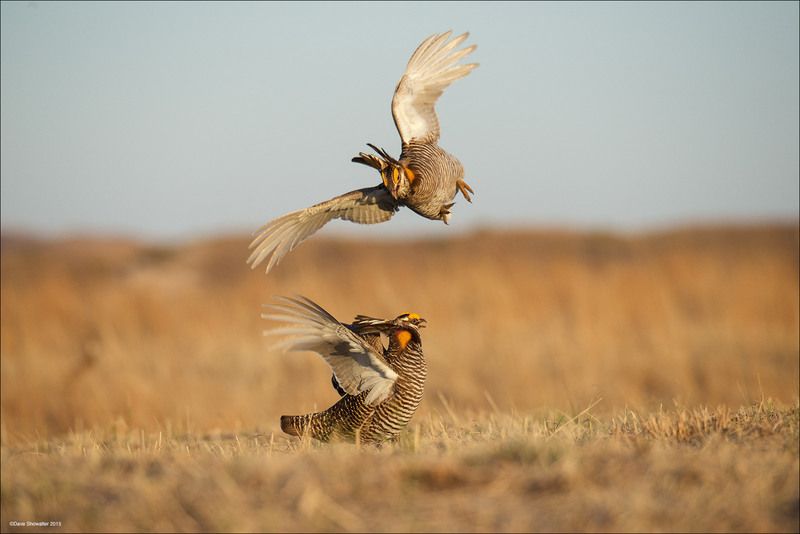 Calamus Outfitters offers a variety of prairie chicken and sharptail grouse photography and viewing trips - they even host an annual prairie chicken festival. The Greater prairie-chicken depends on large expanses of undeveloped grassland and these grouse species are classified as vulnerable. Photo © copyright by Dave Showalter.